Why Read What Other People Say About the Bible When We Can Read It Ourselves? I shared part of my book, Women in the Bible, with some friends at a writers group. They liked what they heard and had questions about how I researched and wrote it. I explained that the Bible was the only resource I used. By design, I didn’t study what other people wrote about the Bible, I simply studied it myself. That is, I went straight to the source and didn’t use any secondhand information. When I write about the Bible, this is what I do. I use Scripture to interpret Scripture, instead of relying on someone else to do it for me. This is because I don’t want to filter what the Bible says through the eyes, minds, and theologies of others. I go straight to the Word of God because this is as close as I can get to the ultimate author of this amazing book. Here are some examples of how I use Scripture to interpret Scripture. The Bible is divided into books, chapters, and verses. This makes it easy to share short passages and compare versions. However, this also encourages us to focus on one verse and miss its context. We should never consider a verse or part of a verse in isolation. Ignoring chapter divisions, paragraph breaks, and inserted subheadings allows us to examine what precedes the passage. Often this gives us the context and a more holistic understanding of how a passage or verse fits in. Likewise, look at what follows the verse or passage. Sometimes the text that comes after it adds clarity, provides an example, or adds emphasis. Yet other times what follows a passage may seem paradoxical. At first a paradox is frustrating, but it’s really an invitation to dig deeper. And that’s when we get to a greater understanding of the passage. As we mentioned, the Bible is subdivided into books. Unlike chapter and verse delineations, the books are mostly logical and make sense. We’re wise to examine the trajectory of the book and consider the author’s overall purpose or theme. The Bible contains some repetition. The four biographies of Jesus—Matthew, Mark, Luke, and John—often present different perspectives of the same event. We’re wising to consider them. Likewise, First and Second Chronicles has parallel texts with First and Second Samuel and First and Second Kings. Also, we can often read about the settings of the prophetic books in the Bible’s historical books, specifically Samuel, Kings, and Chronicles. The same occurs with Psalms. In the New Testament, many of the letters (also called epistles) find their historical context in the book of Acts. Although a lot of people in the Bible are obscure characters, mentioned only once, many others pop up more than one time and surface in multiple books. By combining each mention of a person, we can build a biblical biography of them. This gives us a better understanding of these people and allows us to apply this perspective each time we see their name. I do this often in Women of the Bible. By employing these various techniques, I can use Scripture to interpret Scripture. Yes, I occasionally delve into a commentary (I have four) or read a book on a specific biblical topic. Yet in doing so, I never lose sight of the Bible as the ultimate source of understanding. What others tell me about the Bible does have value, but what I learn directly from the Bible—unfiltered by others—has even more. 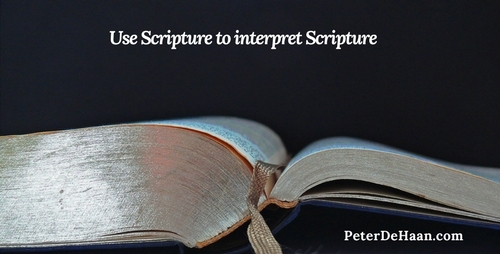 To get the most from reading the Bible, use Scripture to interpret Scripture. I also use scripture to interpret Scripture and pay attention to the definition of words, especially the names of people. I also take into consideration what commentators say. But I keep Mark 15:21 as my anchor, tied to Acts 4:11, John 15:1; Psalm 128:3, and John 20:15-17. Linda, yes, the meaning of people’s names are interesting. I looked up your passages. Why Mark 15:21?